The torrential rainfall of the past week set numerous records in California and the southwestern U.S. For the 7 days ending December 23, the precipitation totals were off the chart---over 600% of normal for at least half of California and Nevada, nearly all of Utah, most of Arizona, and eastward into southern Wyoming and western Colorado. The National Weather Service has reported that the monthly totals so far are now the wettest on record for December at the airports in Los Angeles, Long Beach, Camarillo, Santa Barbara, and Santa Maria. In some of the higher elevations of interior southern California, storm totals ranged as high as 28". The printed amounts on the map to the right are a little hard to read, but note that the yellow areas represent 24-28", and the orange pixels are over 28". Several daily rainfall records were broken by spectacular margins. In the San Joaquin Valley, at Bakersfield, California, the 1.37" on the 18th was over 4.5 times the previous record, which dated back to 1921. The 1.53" on the next day was more than triple the old record and easily beat the all-time daily record for December of 1.02" on the 27th in 1936. 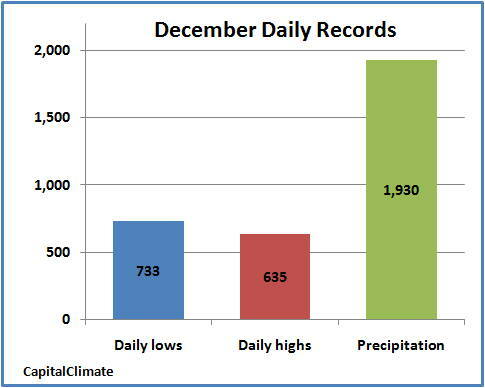 Bakersfield climate records go back to 1889. The 24-hour total of 2.31" on the 18th-19th was double the old December record of 1.15" on December 3-4, 1914. 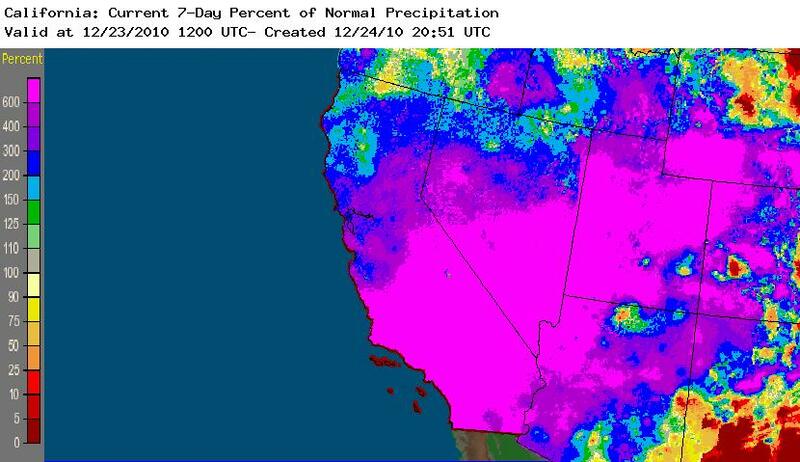 It was also the 3rd highest all-time 24-hour amount at Bakersfield, just behind the 2.32" on January 24-25, 1999. The monthly total of 4.95" so far has exceeded by nearly 2" the old December record of 2.98" set in 1931. This is now within striking distance of the all-time wettest month for Bakersfield, 5.36" in February 1998. WEST WOODCHUCK MEADOW   FRESNO    192"
CHAGOOPA PLATEAU SNOTEL TULARE    120"
WET MEADOWS SNOTEL      TULARE    191"
BISHOP PASS SNOTEL      FRESNO    195"
CRABTREE MEADOW SNOTEL  TULARE    143"
KAISER POINT SNOTEL     FRESNO    168"
Over 1900 daily rainfall records have been set through December 24 in the U.S., nearly 50% more than the total low temperature and high temperature records combined. Of these, 262 were set in California alone, with 58 on the 19th, 44 on the 20th, and 40 on the 22nd. Meanwhile, despite the excess earlier in the month, daily low temperature records are less than 100 ahead of the daily high temperature records for December. The year-to-date ratio of heat records to cold records remains well in favor of the heat records at 2.4 to 1. Oil prices are approaching $90 a barrel, reaching a high of $89.97 in today's trading on the NYMEX exchange and closing at a 2-year high. It's also cold in much of the eastern U.S. and western Europe where a lot of heating oil is consumed, so the weather must be causing the price rise, right? Well, not really. CNBC's Squawk Box this morning had an extended interview with John Kingston, Platts Global Director Of News. He stated that of the major factors affecting oil prices, weather was perhaps third. The primary cause of the price rise is an imbalance between a probably unprecedented increase in demand and OPEC's inability to expand production at a sufficient rate. In particular, China's consumption has increased by 13% since November 2009, driven at least in part by conversion of electricity generation from coal to diesel. Kingston's outlook for 2011: $100 per barrel is well within reach based on demand forecasts. Veteran oil analyst Charles Maxwell, interviewed on Bloomberg, sees $150 in the next several years. Who's the Biggest Terrorist? Yo' Mama! At last week's American Geophysical Union (AGU) meeting last week in San Francisco, Shimon Wdowinsky of the University of Miami proposed a different method whereby unusual strains on the crust might trigger an earthquake. In a talk titled, Triggering of the 2010 Haiti earthquake by hurricanes and possibly deforestation , Wdowinsky studied the stresses on Earth's crust over the epicenter of the mighty January 12, 2010 Haiti earthquake that killed over 200,000 people. This quake was centered in a mountainous area of southwest Haiti that has undergone severe deforestation—over 98% of the trees have been felled on the mountain in recent decades, allowing extreme erosion to occur during Haiti's frequent heavy rainfall events. Since 1975, the erosion rate in these mountains has been 6 mm/year, compared to the typical erosion rate of less than 1 mm/yr in forested tropical mountains. Satellite imagery (Figure 2) reveals that the eroded material has built up significantly in the Leogane Delta to the north of the earthquake's epicenter. In the 2008 hurricane season, four storms--Fay, Gustav, Hanna, and Ike--dumped heavy rains on the impoverished nation. The bare, rugged hillsides let flood waters rampage into large areas of the country, killing over 1,000, destroying 22,702 homes, and damaging another 84,625. About 800,000 people were affected--8% of Haiti's total population. The flood wiped out 70% of Haiti's crops, resulting in dozens of deaths of children due to malnutrition in the months following the storms. Damage was estimated at over $1 billion, the costliest natural disaster in Haitian history. The damage amounted to over 5% of the country's $17 billion GDP, a staggering blow for a nation so poor. Tragically, the hurricanes of 2008 may have set up Haiti for an ever larger disaster. Wdowinsky computed that the amount of mass eroded away from the mountains over the epicenter of the 2010 earthquake was sufficient to cause crustal strains capable of causing a vertically-oriented slippage along a previously unknown fault. This type of motion is quite unusual in this region, as most quakes in Haiti tend to be of the strike-slip variety, where the tectonic plates slide horizontally past each other. The fact that the 2010 Haiti quake occurred along a vertically moving fault lends support to the idea that the slippage was triggered due to mass stripped off the mountains by erosion over the epicenter, combined with the extra weight of the extra sediment deposited in the Leogane Delta clamping down on the northern portion of the fault. Wdowinsky gave two other examples in Taiwan where earthquakes followed several months after the passage of tropical cyclones that dumped heavy rains over mountainous regions. His theory of tropical cyclone-triggered quakes deserves consideration, and provides another excellent reason to curb excessive deforestation!
. . . I happened to see the AP's annual catalog of disaster and realized that the greatest terrorist of all...isn't some radical bomb-thrower. It's The Planet. In the year 2010, earthquakes, heat waves, floods, mega-typhoons, blizzards, landslides and droughts killed a quarter of a million people - most of them in January's earthquake in Haiti. By the AP's calculations, that's more than TWICE the number of people who died in terrorist attacks in the last 25 years, COMBINED. . . This is particularly relevant given the 4 solid pages of prime A-section real estate in today's high-fiber WaPo devoted entirely to analyzing the hundreds of billions being spent annually on "public safety." Apparently we can't afford to spend even a small fraction of that on the much deadlier threat from Momma Nature's attempts to kill us. 6 PM Update: The afternoon model run is consistent with the morning one in showing a low pressure area tracking to the south of the area and bringing Washington snow on Christmas. See here for an example of how snowfall amounts are not necessarily correlated with temperatures. The eyeball-hungry low-fiber WaPo has pimped the "s-word" in six seven consecutive [11 pm Update] 8 out of the last 9 blog headlines, but the broadcast media have been maintaining a sensibly low profile on the chances for Washington snow on Christmas. In today's mid-day sample, WRC, Channel 4, veteran Tom Kierein mentioned the possibility of Washington snow on Christmas, but reined in the hype. Even frequent hyper-personality Tom Sater on WUSA, Channel 9, cautiously backed off the assertions last night of newcomer Anny Hong. LATEST GUIDANCE CONTINUES TO BE IN GOOD AGREEMENT WITH LOW PRESSURE IMPACTING THE REGION SOMETIME FRIDAY AND SATURDAY. THERE STILL REMAINS A GOOD DEAL OF UNCERTAINTY WITH THE TRACK AND DEVELOPMENT OF THE SYSTEM. IF THE LOW TRACKS CLOSER TO THE COAST...SIGNIFICANT SNOW IS POSSIBLE DURING THIS TIME. HOWEVER...IF THE TRACK OF THE LOW REMAINS WELL OFF THE COAST...SNOWFALL WILL BE LIGHT. ALL INTERESTED PARTIES SHOULD DEFINITELY STAY APPRISED OF THE LATEST FORECASTS AS WE GET CLOSER TO THIS POTENTIAL EVENT. The map to the right shows one major model's interpretation of the surface weather for 7 pm, Saturday, December 25. It has a strengthening storm off the Mid Atlantic coast, with snow over much of the DMV (DC/Maryland/Virginia). If interpreted literally (a serious risk at the range of 5 and a half days), it would generate a total for the event of about 3-5" of snow in the region, with the larger amounts in the southern and eastern portions. 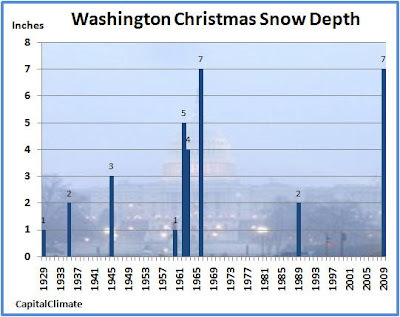 The graph shows snow depth on the ground in Washington on Christmas for each year since 1929. By the way, the 7" last year, while tying the record for the period, had completely disappeared the next day. Note to Ice Ager Linkbot Tom N: If you can find a trend in that data, you deserve to beat out Fred the Singe-r for the Nobel Prize in Cherry Picking. In a town normally overrun with hype, the hyping of Washington snow on Christmas reaches even more extreme heights. With the event still 6 days away, the possibility of Washington snow on Christmas has once again appeared among the blogotariat and the ratings-driven media. The chances of Washington snow on Christmas was featured on at least 3 local TV channels (WTTG-5, WJLA-7, and WUSA-9) tonight; WRC-4 was delayed by the football game too late to make this survey. In fact, this year the cold air is firmly entrenched, but that didn't prevent the earlier outlook for Washington snow [the week before] Christmas to be a complete bust today. Some previous indications of the white stuff for Tuesday have also trended strongly toward the bust-bucket. Nevertheless, some models are hinting at the possibility of a storm developing late in the week and bringing some Washington snow on Christmas. 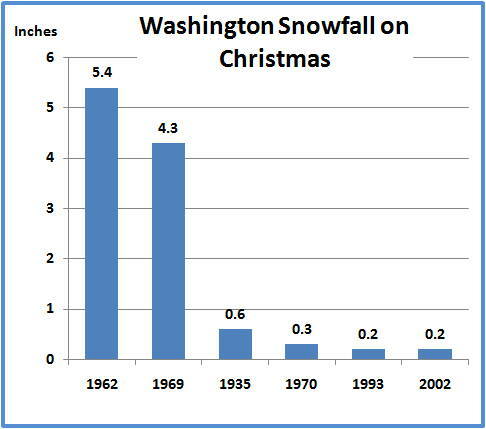 Since that time, there has been one more year with Washington snow on Christmas. That was, of course, 2009, when 7" remained on the ground from the 16" which fell on the 18th-19th. That marked the first time there had been Washington snow on Christmas in 20 years. 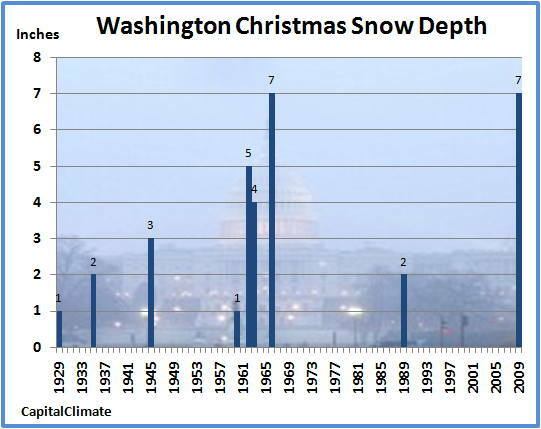 If there is Washington snow on Christmas again this year, it would be only the second time that had occurred in consecutive years since 1929. Still dreaming of Washington snow on Christmas? The odds are certainly better this year than the climatological average, but tonight's glib pronouncement of a "50-50 chance" for Washington snow on Christmas by Washington novice Anny Hong on WUSA, Channel 9, was waaaay premature. 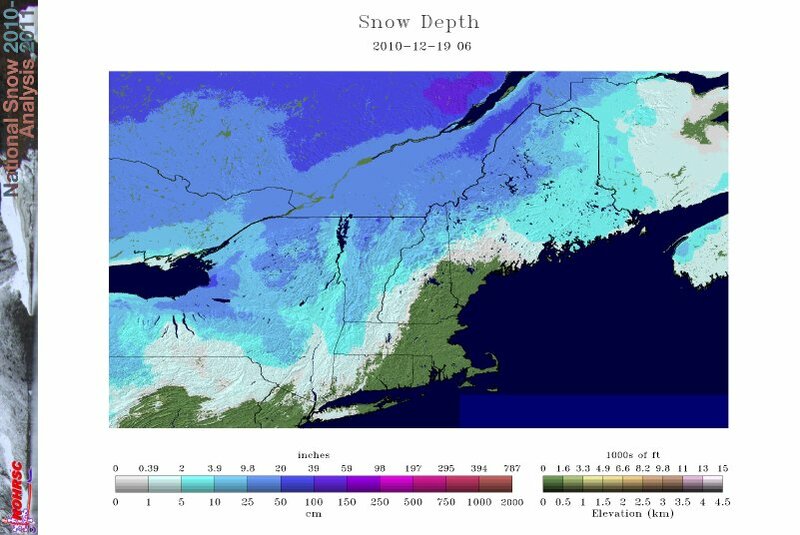 The 1.4" of snow which fell at Syracuse, NY on Friday, December 17, brought the monthly total so far to 70.9". This is the highest amount ever recorded in December at Syracuse. The old record was 70.3" in 2000. Aided by a persistent northwesterly wind over an unfrozen Lake Ontario, snow has fallen on all but 4 days so far this month. Six inches or more fell on each of 4 consecutive days from the 5th through the 8th, and there have been 3 days with at least 10" each. The latest forecast indicates that the greatest chance for more snowfall in the coming week is a 50% probability of snow showers on Monday. The December average temperature of 26.2° so far at Syracuse, while 4.4° below average, is not even within 5° of being in the top 5 coldest Decembers. The coldest on record was 14.7° in 1998. Today's snow depth map for the Northeast from the National Weather Service shows heavy amounts in the lee of the Great Lakes and in the Adirondacks and mountains of northern New England, but little or nothing along the coast and most interior sections.